Us mums can be quite creative when the situation calls for it. From whipping up last minute costumes for school plays to pulling off a sweet family Santa photo when dad can’t make it. 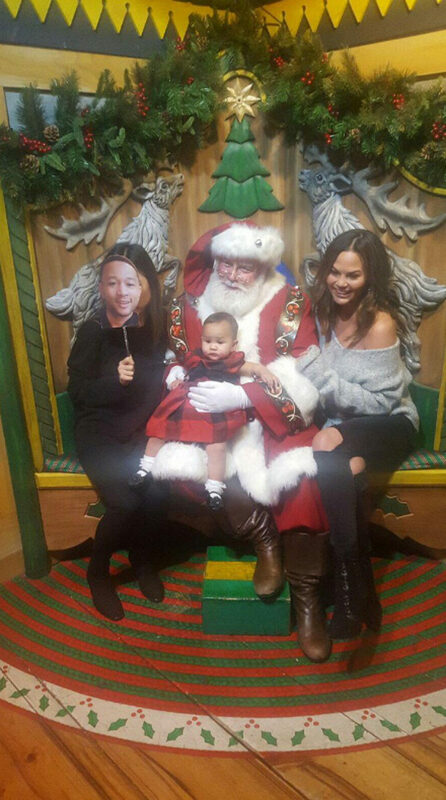 Just check out the adorable holiday happy snap US model Chrissy Teigen managed for daughter Luna’s first visit to old St Nick. With husband John Legend away in Paris, Chrissy Teigen made sure he wasn’t forgotten. She recruited a volunteer to take John’s place on Santa’s knee holding a cardboard cutout of his face on a stick. Chrissy shared the hilarious and sweet photo on Twitter and was applauded by many for her efforts. “This is too cute! Please send out this pic as your Xmas card!!! I love it!!! !” Twitter follower @MrsAprilGC wrote. And we are sure John’s brief response of “savage” just reflects his wanting to be there in person. Chrissy often shares candid snaps of her private life from keeping it real about stretch marks on snapchat to the hilarious realisation that riding a rollercoaster while breastfeeding is probably not the best idea. We’ve watched in awe as she has held her own against online trolls criticising her for having a baby-free dinner out with her husband. But nothing can compete with the cuteness that is little Luna. From her many oh-so-cute Halloween costumes to the moments when her mum just has to stop and stare in awe at what she and John created. And, if the Santa snap wasn’t enough, check out this recent clip of Luna clapping as her grandma sings.